Want to make some seriously fun memories at the beach? We discovered there’s such a thing as a sand castle lesson, and we loved every minute of the sun-drenched & sand-covered event! This fall, we took a much needed weekend trip to Seaside (on Florida’s Gulf coast) and had the adventure of a lifetime. We didn’t know that sand castle lessons were a “thing”, and when we stumbled upon it while looking for things to do, it sounded like a ball! Not entirely sure what to expect (but very much intrigued! ), we booked a lesson. And now, we’re taking you along on the adventure, sharing some tricks of the trade along with how to get the experience for yourself. Enjoy! After meeting our sand castle teacher, our lesson started with scoping out the perfect spot, the most important thing of all. What makes the perfect sand castle spot? Not too far away from the water, but not on wet sand either. Already wet sand won’t bond well because the grains of sand are already expanded, according to our guide. To start our sand castle fortress, we used the shovels to make a big pile of sand for our foundation. Then we got busy hauling buckets of seawater to pour over the sand pile and mixed it well to make sand “concrete”. Once the foundation was a nice, flat wet concrete, the special bottomless buckets were up next to create our towers. We first placed the largest one upside-down on the foundation. Then it was time to shovel sand into the bucket followed by seawater (to mix it with our hands) in stages. It was quite the workout hauling buckets of seawater and using our hands to mix the sand and seawater to perfection! After the largest bucket was filled to the top with the sand and seawater mixture, we added a smaller bottomless bucket on top of it. This time, we pre-mixed sand and seawater in another bucket and scooped it out into the smaller bucket. And the melon baller works great for windows and doors! And a drinking straw is the secret to getting a smooth and seamless look! It was amazing to see how the whole fortress all came together! We had an unbelievable time creating our sand castles and learning the art and tricks of the trade. Our teacher from Beach Sand Sculptures made it an absolute blast!!! So, if your inner kid is jumping up and down at the thought of spending an afternoon at the beach making beautiful sand castles, click here to get your session booked! They’ll meet you on several different beaches on Florida’s Gulf Coast & Highway 30A. Now, one more important thing! Since sand castles can be a mountainous obstacle for sea turtles who might be nesting or hatchlings trying to make it to the big blue, be sure to knock down and flatten your castle before nightfall. We left it up for the day to be admired, and checked back in the evening to deconstruct our creations. It looked like some kiddos had done the work for us! The beautiful sunset was a perfect ending to a memorable day. Sun-drenched, sand-covered, and seaside. What more could you want? Donut understand why dry sand is so important, but then you wet it. I can never be that artistic anyway !!!! But very nice to see someone who can. Yes, our teacher said that dry grains expand when wet, making it bond better, whereas wet sand grains are already expanded and don’t bond well. Some science behind the art! And we had a great teacher to show us how the tools can be used — we started as novices! Wow! Lots of fun and interesting details and techniques! 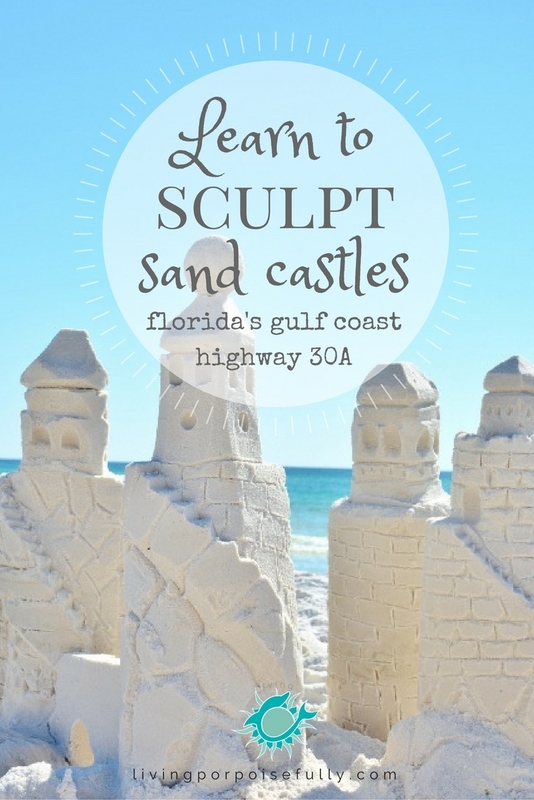 I never thought about a class to learn how to build a sand castle, or to use those tools. Thanks for bringing this to us. I love that fine, white, squeaky sand!